Right Handed. No Bottom Cap. Can be repaired. Also has a little tape residue that should clean off. Mike Bellm started with a 357 Mag barrel and did the custom rechambering on it to 357 HERRETT. The barrel has front and rear sights. WE WILL SERVICE THESE PRODUCTS AFTER THE SALE. Vintage Grip Stock for the G1 Thompson Contender Pistol. Condition is Used. Shipped with USPS First Class Package. Brand New! Barrel Part For Your Favorite Firearm! They are a 10-32 thread. Blue painted grip. It has some paint chips but pretty good shape overall. Please email any questions before you bid. You are buying as is. Please know if this is legal in your jurisdiction before bidding. We estimate this grip was manufactured late 1980s. This grip has been little fired. Local pickup OK. We always have, since 1952. Thompson/Center 6144222 Contender Super Barrel .44 Rem Magnum Steel 14"
All contender barrels are interchangeable and available in blue or stainless steel. 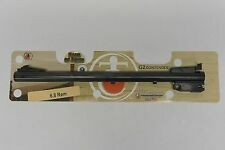 G2 Contender Pistol Barrel,12", 44 Remington Magnum, Blued. Model: G2 Contender. Gauge/Caliber: 44 Rem Mag. We are adventurists sharing the outdoors with everyone. Mike Bellm's TCs has been serving the TC shooting community for over 30 years, you are buying from the trusted TC Encore and Contender expert. Bellm Custom Accuracy Oversized Hinge Pins for TC Encores, Contenders, and G2s remove the shake and rattle at the hinge area, improve accuracy, and give the precision fit you find in the world's most expensive high grade guns. This is a non-tapered bull barrel in 14" length in blue steel, with adjustable sights. If you have the new "G2" Contender, use "G2" pistol forends. If you have an original Contender, use original pistol forends. Brand New! Gun Parts For Your Favorite Firearm! New Brand Tc4275 Thompson Center Contender-G2 23" Blue 7-30 Waters New Brand Tc4275 Thompson Center Contender-G2 23" Blue 7-30 Waters. Good condition lightly used hotshot barrel. Used to shoot shotshells.